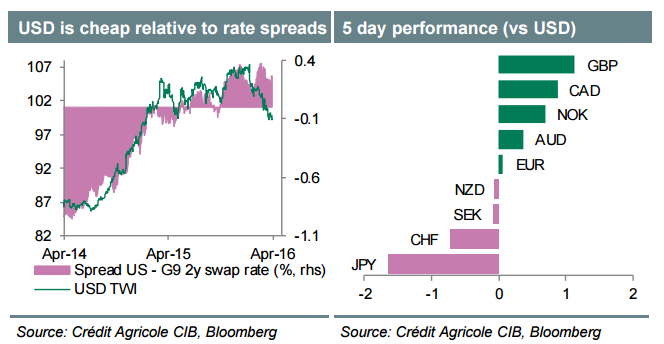 Week Ahead: Will Divergence FX Trade Stage A Comeback Into FOMC & BoJ? "We think that investors will revisit the topic of policy divergence ahead of the April FOMC meeting. Despite recently disappointing activity data, we expect the policy statement to present a more balanced outlook for the economy and inflation than in March, supported by the recent recovery in commodity prices and the improvement in global financial conditions. To the extent that this is seen as a step away from the Fed's overly cautious stance at the start of the year, it can set the stage for a cautious USD rebound especially against currencies where we believe more monetary easing is only a matter of time." "We maintain a fairly constructive outlook for USD/JPY over the longer-term. We also think that other 'divergence' trades could be attractive as well in the nearterm. In particular we believe that a bearish JPY view could also be expressed against currencies with central banks that have reached the limits of their easing programmes, like SEK and EUR." "Elsewhere, we have stressed the risks to the rally in commodity currencies. As a weaker USD on the back of the more dovish Fed were among the important pillars of the rally, we will not be surprised to see a bout of profit taking in the aftermath of the FOMC meeting. Another theme that could gain more traction is the apparent abatement of Brexit risks as confirmed by polls." "We suspect that GBP could remain supported against safe haven currencies like JPY and CHF." The US dollar ended the week on a positive note. GDP reports from the US and elsewhere, durable goods orders and the Fed meeting all stand out. Also note the BOJ’s decision which has become more important now. These are the highlights of this week. German Ifo Business Climate: Monday, 8:00. German business sentiment was lifted in March, after three consecutive declines, amid higher optimism about current situation as well as future outlook. IFO business climate index increased to 106.7 in March from 105.7 in February. Analysts expected a mild rise to 106.1. Business expectations increased to 100.0 in March from an upwardly revised 98.9 in February, but remained distinctly below levels posted at the end of last year. Analysts expect business sentiment will remain sluggish in the coming months. Economists expect business climate to rise to 107.1. US Durable Goods Orders: Tuesday, 12:30. New orders for long-lasting U.S. manufactured goods declined in February amid the prolonged dollar strength and low oil prices. Orders for durable goods declined 2.8% after a downwardly revised 4.2% increase in January. Economists expected a stronger decline to -3%. The drop in durable goods orders supports recent data suggesting the downward trend in manufacturing is nearly over. Meanwhile, core orders excluding transportation, fell 1.0% after a 1.8% gain in the previous month. Orders for durable goods are expected to increase by 1.9% this time, while core orders are estimated to edge up 0.6%. US CB Consumer Confidence: Tuesday, 14:00. Consumer sentiment in the US regained strength in March, amid higher optimism about the short-term outlook for the economy. The Conference Board’s index edged up to 96.2 in March from an upwardly revised 94.0 in February while economists anticipated a decline to 93.9. The six months outlook section showed an improvement to 84.7 from 79.9 the prior month. But the present condition dropped slightly to 113.5 from 115 in February, reaching its lowest level since November. Consumer sentiment has been mostly positive for more than a year while consumer spending has slowed recently, rising only 0.1% each month between December and February. But the U.S. labor market has been steadily improving, adding jobs and wages over the past year. Consumer confidence is expected to register 95.8 in April. UK GDP data: Wednesday, 8:30. The UK economy expanded by 0.6% in the last quarter of 2015, reaching a better growth rate according to the latest data. However, the yearly growth rate was lower than the 2.9% gain posted in the previous year. Despite the decline in growth, the UK economy is still one of the fastest growing developed nations. The reading was in line with market consensus. UK GDP is expected to reach 0.4% this time. US Crude Oil Inventories: Wednesday, 14:30. Oil prices increased 4% last week after a smaller-than-expected increase in U.S. crude inventories offset worries of increased output on the part of Kuwait. Crude stocks rose 2.1 million barrels while expected to rise 2.2 million-barrel. Crude prices had initially tumbled after the Kuwaiti oil and gas industry called off their three-day strike and increased their output to 1.6 million barrels per day (bpd) from 1.1 million on Sunday. US rate decision: Wednesday, 18:00. In the previous policy meeting, the Fed said it is not going to raise its key interest rate initially planned. The Fed also cut its forecast for U.S. economic growth and inflation, radically lowering its estimate for the number of rate hikes in 2016. Janet Yellen, had estimated in December that the economy would grow 2.4% this year and that the Fed would raise rates four times. But then, stock markets became volatile, oil prices plunged and fears of a U.S. recession intensified in January and early February. As a result, Yellen and the Fed leaders are expecting only two rate hikes this year. The Fed also lowered its economic growth outlook for the year to 2.2%, compared with 2.4% previously reported. Furthermore, the Fed also noted that future rate hikes will be gradual and that the “policy is not on a pre-set course” and will change with accordance to economic conditions. NZ rate decision: Wednesday, 21:00. The Reserve Bank of New Zealand cut rates by 25 basis points reaching 2.25% on its March meeting. The move was not anticipated by analysts. The bank said that the global economic outlook worsened since December with weaker growth in China and Europe. RBNZ’s governor Graeme Wheeler said New Zealand’s dairy industry experiences difficult challenges but domestic growth is gathering strength amid strong inward migration, tourism. Wheeler also said that more interest rate cuts will be done in order to ensure inflation settles near the middle of the target range. Japan rate decision: Thursday. The Bank of Japan kept its interest rates unchanged from its last meeting in January where it shocked markets by adopting a negative interest rate policy implying on further rate cuts if needed. The central banks said exports and production were sluggish mainly due to the slowdown in emerging markets. Sluggishness is expected to continue in exports and production for the coming days, while domestic demand is expected to gather strength. US GDP data: Thursday, 12:30. U.S. economic growth expanded less than expected in the fourth quarter as the strong dollar and sluggish global demand weighed on exports. Gross domestic product increased 0.7% annual rate. Investment by energy firms declined with lower oil prices. Growth in consumer spending also slowed. However, the labor market strengthened. The Federal Reserve acknowledged that growth slowed late last year, but also noted that the labor market conditions improved further. US economy is expected to grow by 0.7% in the first quarter. US Unemployment claims: Thursday, 12:30. Weekly jobless claims posted an unexpected drop reaching 247,000 following 253,000 in the previous week. The reading was better than the 265,000 predicted by analysts. 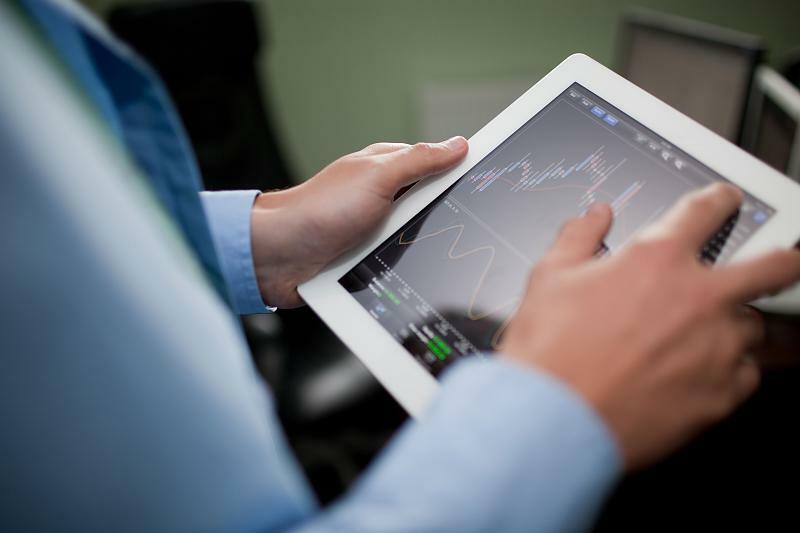 The four-week moving average declined by 4,500 to 260,500 from the previous week. The number of new claims is expected to reach 252,000 this week. Canadian GDP data: Friday, 12:30. Canada’s economy expanded for the fourth consecutive month in January, growing by 0.6%. The reading was better than the 0.3% forecast. Manufacturing sector expanded by 1.2% far better than the 0.4% anticipated. Oil and gas, manufacturing, retail trade, utilities and finance expanded, while wholesale trade and the arts, entertainment and recreation sectors contracted. The mining sector also shrank, mainly as a result of a decline in copper, nickel, lead and zinc. 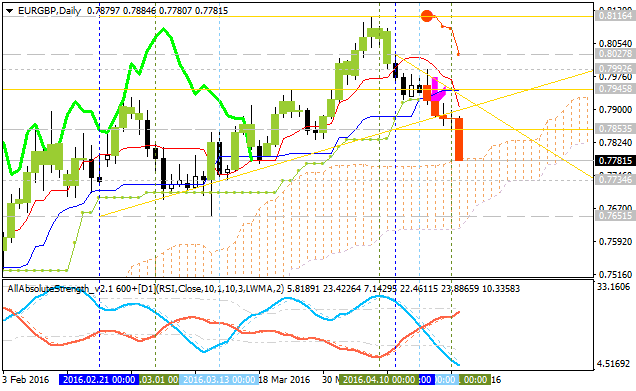 EUR/GBP: breakdown with daily bearish reversal. The pair is on breakdown by breaking key support levels to below testing Senkou Span line for now for the breakdown with bearish reversal to be continuing. Chinkou Span line is breaking the price to below on open bar for breakdown, and Absolute Strength indicator is estimating the bearish reversal to be started in the near future.